curated by Walker Assistant Curator of Visual Arts Joan Rothfuss. "He leaves the room and lost himself in the staircases "
northern, Flemish-speaking region of Belgium. He studied art history. country with two official languages. that remarks, so to speak, on its own impossibility. Luyten has had solo exhibitions at the Museum of Contemporary Art in Antwerp, The Power Plant in Toronto, and the Contemporary Art Space in Lausanne, Switzerland, and he has appeared in group exhibitions in Brussels, Munster, Metz, The Hague, Ludwigshafen, Maastricht, and other cities. He is currently working on a commission for the Museum of Modem Art, Dublin. "With all there is room for in that"
In 1993, Luyten was asked by the Walker to produce a body of work that thematically linked the Sculpture Garden with the Walker's indoor spaces. Over the next two years he visited the Twin Cities four times annually, at the beginning of each season, to create a new element for the project. These appeared in various public locations in the museum and the Garden. Each new element took the place of the previous one, forming a continuously evolving constellation of notations, ideas, and objects. The projection was complete in March 1996, and its components will form the basis for the exhibition and catalogue. otherwise empty display case, and installed it in the middle of the museum's lobby. The poet's evocative description of a landscape quieted and hidden beneath a covering of snow was physically echoed by Luyten's placement of it within the large, white "field" of the display case. The poem's text evokes the themes addressed in his own work, which he has described as dealing with "human desire and the unattainability of things, as reflected in man's relationship to nature." 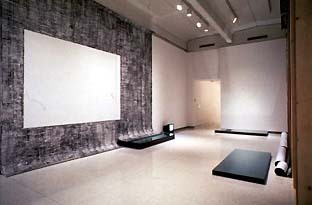 Subsequent installations have taken place in the Minneapolis Sculpture Garden, where LuyLen organised a four-part outdoor film screening; the Cowles Conservatory, in which he placed large sheets of glass engraved with texts on nature in four languages; and various spaces inside the museum including hallways, stairwells, and offices as well as galleries. 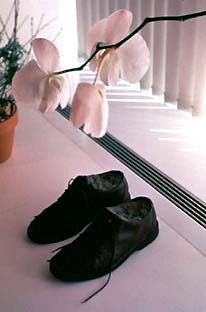 Besides film and sculptural objects, he has included works in video,drawing, and photography, many of which incorporated prose and poetry by such authors as Marcel Proust, Claude Levi-Stauss, Paul Celan, and Italo Calvino. Because he often reuses objects and ideas from previous installations in the cycle, the viewer' s understanding of the work is gradual and cumulative, comparable to the process of reading a book or watching a film. other in Luyten's backyard garden in Antwerp. A third element was a group of Super-8films shot by Walker staff members in the Sculpture Garden. Finally, the installation included a spoken text - written by the artist - on the very specific yet paradoxically generic nature of home.